Michael Hutchings is an Emeritus Professor at the School of Life Sciences, University of Sussex. He has spent his academic career working at the University of Sussex, having been appointed as lecturer in 1973 and gaining promotions to become Professor of Ecology in 1998. In addition to teaching and administrative duties, he has undertaken a large amount of research, in a variety of fields throughout my career. In particular, he has worked and published extensively on the behavior of clonal plant species and their responses to environmental heterogeneity, which are mediated to a large extent by their modular nature and vascular sectoriality. He has also collected and published many papers on the most extensive and detailed sets of demographic data available for plant species, including several rare and endangered species. Finally, he has undertaken long-term studies of the feasibility of restoring calcareous grassland communities on habitat that has been abandoned for arable cultivation. Although these are his main research fields, he has researched and published extensively in other areas as well. To date, his research has led to the publication of almost 120 scientific papers, nearly all in high impact international quality journals. Many of his publications are regarded as seminal works. The wide impact of this body of scientific work is manifested in the fact that he is listed in the ISI Highly Cited website (category Ecology and Environmental Sciences. Other honors bestowed on him include two Visiting Erskine Research Fellowships at the University of Canterbury in New Zealand (1994 and 1997), the award of a Leverhulme Research Fellowship from The Leverhulme Trust, UK (2005), and conferment of the title of Honorary Research Associate by The Royal Botanic Gardens, Kew (2009). Another indication of him standing in the global community of plant ecologists is his tenure since 2004 of the position of Executive Editor of the Journal of Ecology, the most important research publication in the field of plant ecology. Bill Kunin graduated in Biology from Princeton, received a Master’s Degree in Public Policy at Harvard, and a Ph.D. in Zoology at the University of Washington in Seattle. Today he is a professor at the University of Leeds, one of the UK’s largest Universities, and is part of the research-intensive Russell Group. His research focuses on spatial aspects of the interactions between plants and the pollinator and herbivores that feed upon them, but extends to cover aspects of conservation biology, community ecology and biogeographic issues. He manages the BSc program in Ecology & Environmental Biology, is director of BIOCONS (the European Centre for Biodiversity and Conservation Research) a Marie Curie Early Stage Training site, and is active in organizing the University’s interdisciplinary Earth and Biosphere Institute, and UKPopNet a NERC-funded distributed center of population biology research. His current research includes several interdisciplinary collaborations, including a NERC PgP project on the range limits of a sub-arctic/alpine plant, two RELU projects on scale effects in farmland biodiversity and sustainable uplands, and coordinating field based research in the EU FP6 ALARM project. (1) unprecedented means of collecting data at several chemical, physical, biological levels and spatial scales; (2) relatively cheap and accessible computer power to store this data; (3) (1) and (2) trigger an immense number of new possibilities to understand biological system ranging from individual level processes to ecosystem dynamics; (4) (1), (2) and (3) create new challenges to link mechanistic theories with empirically grounded hypothesis across scientific disciplines. 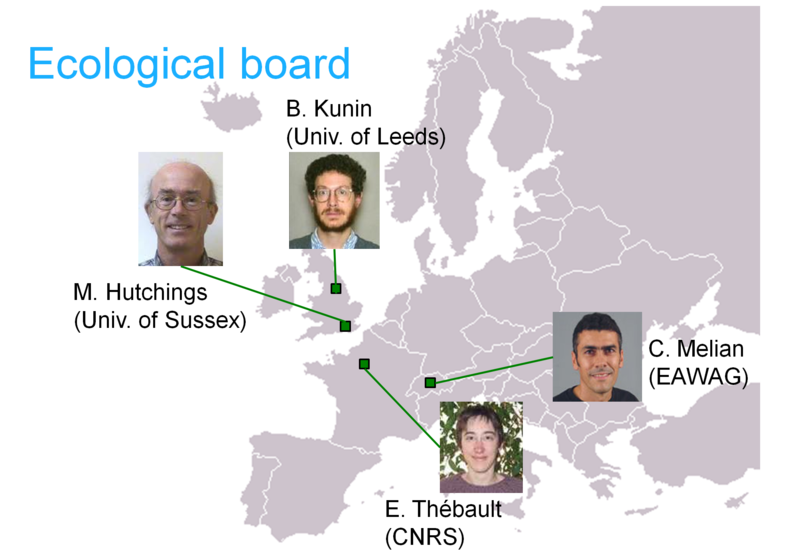 Currently their research questions mainly focus on the integration of highly heterogeneous data at different biological levels and spatial scales using mainly stochastic modeling. One major focus of their current research is the development and test of neutral ecological and evolutionary network models using fossil, historical and contemporary data. The final dream is to unify the fascinating details of physical, chemical and biological systems in a general and testable framework. Elisa Thébault studies ecological modeling: impact of biodiversity loss on ecosystem functioning, trophic and mutualistic interactions in complex networks, effects of land use and climate change on soil food webs and related ecosystem services, effects of fishing on marine food webs; and the analysis of ecological network topology: pollination and herbivore networks, soil food webs, marine and lake food webs. Dr. Thebault is trained in theoretical ecology, and one of her main research interest concerns how diversity and interactions between species influence community properties, stability and ecosystem functioning, both in aquatic and terrestrial ecosystems. Her work on the links between diversity and stability has shown that biodiversity can provide an insurance against environmental disruptions and thus promote the stability of ecosystems. In particular, she has shown that the diversity-stability relationship depends on the strength of trophic interactions and its trade-off with diversity, as well as on the type of interactions between species and on the structure of ecological interaction networks. Her work has been published in 12 articles in journals of rank A, as well as in one book chapter. Dr. Thébault is part of the BIOEMCO (Biogeochemistry and Ecology of Continental Ecosystems) laboratory, which gathers about 150 scientists (soil scientists, chemists, ecologists, plant physiologists and specialists of isotopes and experimental ecology). It is comprised of 5 thematically different research groups. The large diversity of specialists conducts research with the general objective of studying the structure, function and dynamics of terrestrial and aquatic ecosystems in order to ensure sustainable development and environmental integrity. In DIVERSIFY, BIOEMCO is represented by Elisa Thébault, a member of the “Biodiversity and Ecosystem Functioning” research team, a multidisciplinary research group focusing on the interactions between community structure and ecosystem functioning using various approaches (laboratory and field experiments, comparative approaches, modeling, population dynamics, ecological stoichiometry, ecological engineering).